Powder coating is a dry finishing process that has become extremely popular since its introduction in North America over in the 1960s. 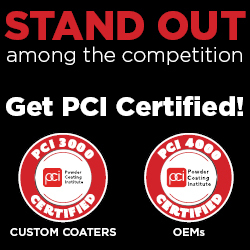 Representing over 15% of the total industrial finishing market, powder is used on a wide array of products. More and more companies specify powder coatings for a high-quality, durable finish, allowing for maximized production, improved efficiencies, and simplified environmental compliance. Used as functional (protective) and decorative finishes, powder coatings are available in an almost limitless range of colors and textures, and technological advancements have resulted in excellent performance properties. Powder coatings are based on polymer resin systems, combined with curatives, pigments, leveling agents, flow modifiers, and other additives. These ingredients are melt mixed, cooled, and ground into a uniform powder similar to baking flour. A process called electrostatic spray deposition (ESD) is typically used to achieve the application of the powder coating to a metal substrate. This application method uses a spray gun, which applies an electrostatic charge to the powder particles, which are then attracted to the grounded part. After application of the powder coating, the parts enter a curing oven where, with the addition of heat, the coating chemically reacts to produce long molecular chains, resulting in high cross-link density. These molecular chains are very resistant to breakdown. This type of application is the most common method of applying powders. Powder coatings can also be applied to non-metallic substrates such as plastics and medium density fiberboard (MDF). Powder coating is a high-quality finish found on thousands of products you come in contact with each day. Powder coating protects the roughest, toughest machinery as well as the household items you depend on daily. It provides a more durable finish than liquid paints can offer, while still providing an attractive finish. Powder coated products are more resistant to diminished coating quality as a result of impact, moisture, chemicals, ultraviolet light, and other extreme weather conditions. In turn, this reduces the risk of scratches, chipping, abrasions, corrosion, fading, and other wear issues. It's tough. It looks great. And it lasts a long, long time. In addition to being durable, powder coating is an attractive choice due to environmental advantages.